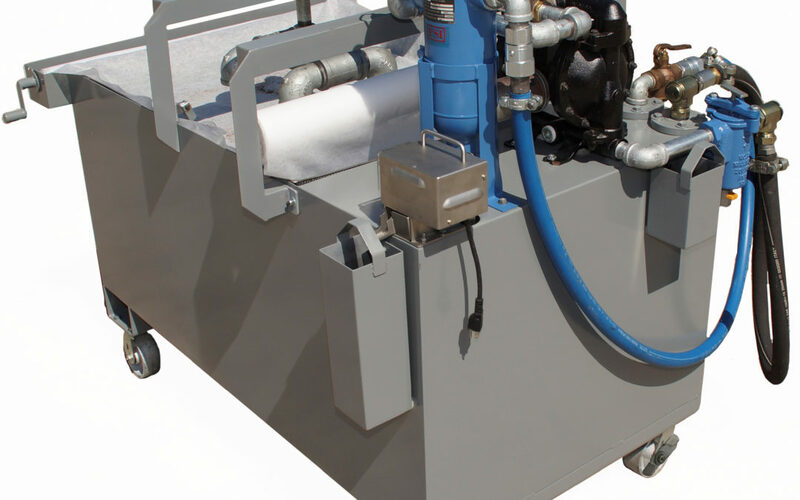 The AMCOL SF 160 SURECLEAN Mobile Coolant Reclamation System is designed to extract water dilutable metalworking fluids from small sumps to remove suspended solids, skim tramp oils, and return a rejuvenated fluid to the machine. Ideal applications include CNC machining centers, roll forming mills, deburring tumblers, wash tanks, and other recirculating sumps that can collect solids and are not easily fitted with conventional ongoing filtration. The AMCOL SF 160 SURECLEAN Mobile Coolant Reclamation System is a stand-alone system that can be rolled up to your machine, complete the process, and then move on to the next machine. These systems require only plant air and a 110V grounded plug. Coolant is siphoned from the sump and dispersed over the media filter located on the top of the reservoir. While the tramp oil is allowed to separate in the reservoir, the machine sump is properly vacuumed of chips and other solid contaminants and wiped down further as may be necessary. Tramp oils that separate on top of the coolant are removed with the belt skimmer provided and collected in a small collection box located on the side of the reservoir. Once the machine is cleaned, the coolant is filtered and purified in a final polishing stage as it is returned to your machine sump. Once the process is complete, all of the components of the system are returned to the ready positions and then the system can be transported to the next machine to repeat the process.